We can all be proud of the commitment of our city to preserve and replace the trees in our neighbourhoods. In order to raise awareness about the beautiful trees which populate our streets and parks, we will be bringing in a local writer who will conduct tree tours for the residents. 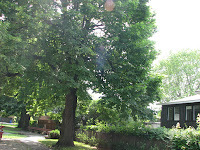 Bronwyn Chester will give tours, which will allow residents to learn about the value and the variety of trees in Côte Saint-Luc. These tours will be given on three consecutive Wednesdays August 26, September 2 and September 9 from 5:30pm to 7pm. Please call the library at 514-485-6900 to register. The tours are free. Tour 1 (August 26, 2009): Veterans Park forest and Nathan Shuster Park. Rendez-vous at the library. Tour 2 (September 2, 2009): District 3, Baily to Merton. Rendez-vous at synagogue on Baily Rd. Tour 3 (September 9, 2009): District 5, Westminster to Blossom. Rendez-vous at Beth Zion synagogue.